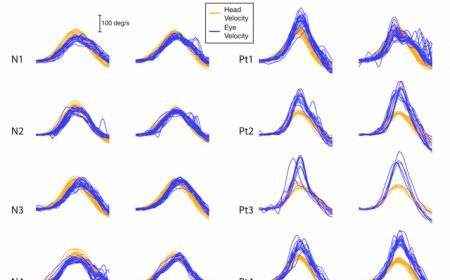 Superimposed records of head velocity (orange traces) and eye velocity (blue traces) over time for repeated horizontal head impulses to the left side and to the right side for four healthy subjects and for four patients with Menière’s Disease. Eye velocity records have been inverted for easier comparison with head velocity. In the healthy subjects (first 2 columns) the records¬¬ of eye velocity are very similar to those of head velocity, because the vestibular (balance) system is able to drive the eyes accurately in the opposite direction to head velocity. However, in the patients with Menière’s Disease (last 2 columns), the peak eye velocity tends to be significantly higher than the peak head velocity. This is consistent with an enhanced gain of the vestibulo-ocular reflex. With GPRWMF support we developed a simple new fast measure of vestibulo-ocular response - the video head impulse test (vHIT) - which measures the eye movement response to brief passive, high acceleration unpredictable head rotations - head impulses (MacDougall et al. 2009; Curthoys 2012; MacDougall et al. 2013; MacDougall et al. 2016). vHIT has now been in use around the world for the last 5 years and many thousands of patients have been tested by it. It has been extremely useful in detecting reduced canal function. However it has become clear that many patients do not have reduced function but instead have enhanced canal function and this project is about analysing the data of such patients and determining if their enhanced response is systematically related to their symptoms. We seek to characterize the both the reduced and enhanced vHIT responses - exactly how does the eye movement response change both in patients after intratympanic gentamicin and in patients with enhanced VOR gain. We will analyse both the slow phase VOR and the pattern of corrective saccades and how that saccadic pattern changes during recovery.